First things first. inFamous 2 is certainly a game that you can pick up and play without ever having played inFamous, However, it unapologetically makes the assumption that you have. There's nothing to get the "just tuned in" crowd caught up on the proceedings and you begin the game with its protagonist Cole MacGrath already powered-up with powers that had to be earned during the course of the first game. This is not at all a knock against inFamous 2, but rather a suggestion to those you that missed the first game to give it a playthrough before taking on inFamous 2. inFamous 2 is a great game, but the experience will be made even better if you start the game with some familiar faces. At the open of the game, Cole squares off against The Beast but things don't go very well for him. Cole runs south to New Marais (a thinly disguised stand-in for New Orleans) to further develop his powers before the inevitable rematch. New Marais is a videogame city of the living, breathing variety, filled with citizens going about their daily lives on foot and in cars. As you work to build your powers and gain new ones you can choose to help out the local citizenry by fighting the local militia that keeps a jackboot poised above their heads ... or to add to their misery. Your choices affect your overall karma and you choice between good or evil will eventually lead you to one of two different ultimate power sets. It doesn't really pay to be a wishy-washy centrist, so the game is primed for a second playthrough with a walk down the other path. Pursuing each path will require you to take on different optional missions and respond to a different set of random encounters, so the second time through really does give you a different experience with the game – and a different ending to boot. If the good one time, evil the next isn't enough for you, you'll get even more mileage out of the game from its UGC (User Generated Content) feature. This is just what it sounds like – anyone can create optional missions for the game and upload them to the PlayStation Network. As you play the game you'll see UGC missions appear on the map and you can undertake them to earn some extra experience. When you complete the mission you'll be asked to rate it, and you can use the aggregated rating for a UGC mission to determine if it's worth your while to undertake. 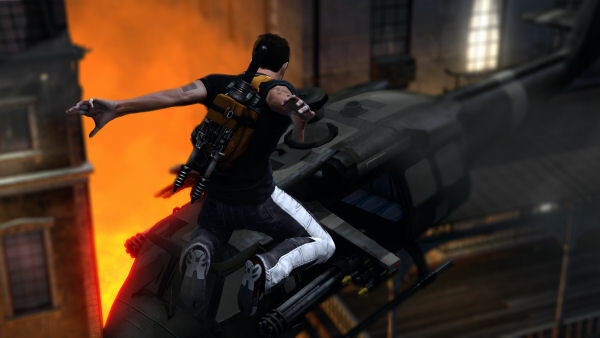 Using the game's tools to create a mission is not exactly the easiest thing in the world to do, but there are plenty of modders out there with the patience to put in the work it takes to make an enjoyable mission and the game's developer Sucker Punch has helped seed the UGC landscape with a number of missions it's developed itself. UGC is a great idea and adds a lot to the replay value of the game, which is certainly a welcome addition to a game that's so much fun to play in the first place. New Marais is fun to explore, especially given Cole's Spidey-like climbing skills and parkour move set. The controls make the climbing, jumping, and line-sliding easy to perform and literally turn the city into your playground. It also opens up your attack options when you can quite literally get the drop on your enemy. 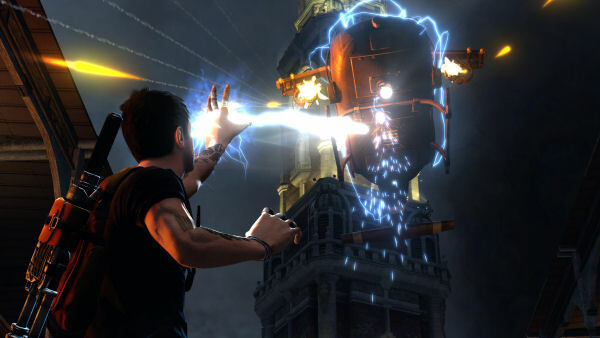 Those who make full use of Cole's skills will also benefit by finding the power shards hidden all over the city that can be collected and converted to more power for Cole as well as tape recordings that are for some reason strapped to flying pigeons and give additional insight into the game's story. There are also optional stunt missions that have you doing things like trying to cross a stretch of the city's rooftops jumping through hoops before a timer expires. I've never been a big fan of these kinds of missions and to be honest the ones in inFamous 2 don't really do anything to change my mind. At least they're optional so you can forgo them if you'd like, although it means passing on a chance to rack up more experience. For the most part, the battles are enjoyable and the game encourages creative use of your powers when eliminating foes – or incapacitating them if you're a good karma kind of player. Pretty early on in the game you're given a melee weapon known as the Amp, which is basically an electrified baseball bat. It's fun to use and can be a good way to clear back a crowd, but there are some camera issues that creep in when you're taking on multiple enemies in which it can be quite difficult to see who's attacking you. It can be annoying, especially when it leads to a cheap death, but it's not enough on its own to mar an otherwise thoroughly enjoyable game. Final Rating: 95%. Sucker Punch delivers another knockout game.